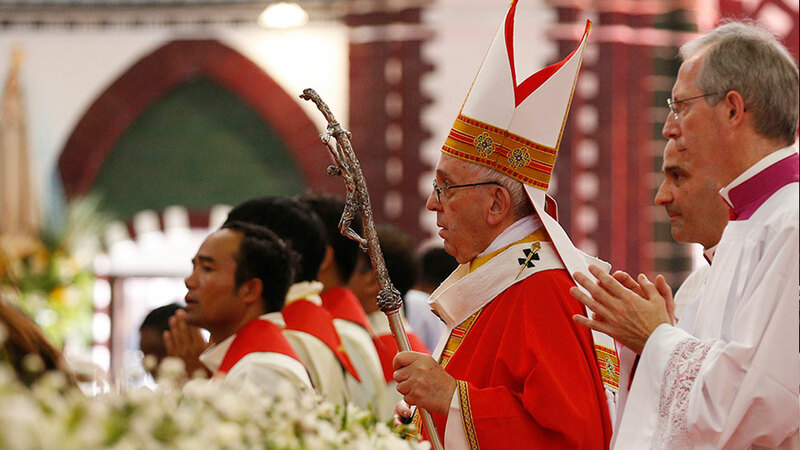 On Thursday morning, after having leaving the Archbishop’s Residence, Pope Francis travelled to St. Mary's Cathedral in Yangon for Mass with young people. Before entering the Cathedral, the Pope greeted the faithful gathered outside from the Popemobile. At 10:45 am local time (4:45 pm Rome time), Pope Francis presided at the Eucharist on the liturgical feast of St Andrew the Apostle. Young people from throughout the entire country took part in the Mass. At the conclusion of the Mass, Cardinal Charles Bo, SDB, Archbishop of Yangon expressed thanks to the Pope. After the final blessing, Pope Francis travelled by car to Yangon International Airport for the official departure ceremony from Myanmar. As my visit to your beautiful country draws to a close, I join you in thanking God for the many graces we have received in these days. Looking out at you, the young people of Myanmar, and all those who are united with us outside this cathedral, I want to share with you a phrase from today’s first reading that resonates within me. Taken from the prophet Isaiah, it was echoed by Saint Paul in his letter to the young Christian community in Rome. Let us listen once again to those words: “The footsteps of those who bring good news are a welcome sound” (Rom 10:15; cf. Is 52:7). Dear young people of Myanmar, hearing your young voices and listening to you sing today, I want to apply those words to you. Yes, you are “a welcome sound”; you are a beautiful and encouraging sight, for you bring us ‘good news’, the good news of your youth, your faith and your enthusiasm. Indeed, you are good news, because you are concrete signs of the Church’s faith in Jesus Christ, who brings us a joy and a hope that will never die. Some people ask how it is possible to speak of good news when so many people around us are suffering? Where is the good news when so much injustice, poverty and misery cast a shadow over us and our world? But I want a very clear message to go out from this place. I want people to know that you, the young men and women of Myanmar, are not afraid to believe in the good news of God’s mercy, because it has a name and a face: Jesus Christ. As messengers of this good news, you are ready to bring a word of hope to the Church, to your own country, and to the wider world. You are ready to bring good news for your suffering brothers and sisters who need your prayers and your solidarity, but also your enthusiasm for human rights, for justice and for the growth of that “love and peace” which Jesus brings. But I also have a challenge to set before you. Did you listen carefully to the first reading? There Saint Paul repeats three times the word unless. It is a little word, but it asks us to think about our place in God’s plan. In effect, Paul asks three questions, and I want to put them to each of you personally. First, how are people to believe in the Lord unless they have heard about him? Second, how are people to hear about the Lord unless they have a messenger, someone to bring the good news? And third, how can they have a messenger unless one is sent?” (Rom 10:14-15). I would like all of you to think deeply about these questions. But don’t be worried! As a loving “father” (or better, a “grandfather”! ), I don’t want you to wrestle with these questions alone. Let me offer a few thoughts that can guide you on your journey of faith, and help you to discern what it is that the Lord is asking of you. Saint Paul’s first question is: “How are people to believe in the Lord unless they have heard about him?” Our world is full of many sounds, so many distractions, that can drown out God’s voice. If others are to hear and believe in him, they need to find him in people who are authentic. People who know how to listen! That is surely what you want to be! But only the Lord can help you to be genuine, so talk to him in prayer. Learn to hear his voice, quietly speaking in the depths of your heart. Paul’s second question is: “How are they to hear about Jesus without a messenger?” Here is a great task entrusted in a special way to young people: to be “missionary disciples”, messengers of the good news of Jesus, above all to your contemporaries and friends. Do not be afraid to make a ruckus, to ask questions that make people think! And don’t worry if sometimes you feel that you are few and far between. The Gospel always grows from small beginnings. So make yourselves heard. I want you to shout! But not with your voices. No! I want you to shout with your lives, with your hearts, and in this way to be signs of hope to those who need encouragement, a helping hand to the sick, a welcome smile to the stranger, a kindly support to the lonely. Paul’s last question is: “How can people have a messenger unless one is sent?” At the end of this Mass we will all be sent forth, to take with us the gifts we have received and to share them with others. This can be a little daunting, since we don’t always know where Jesus may be sending us. But he never sends us out without also walking at our side, and always just a little in front, leading us into new and wonderful parts of his kingdom. How does our Lord send Saint Andrew and his brother Simon Peter in today’s Gospel? 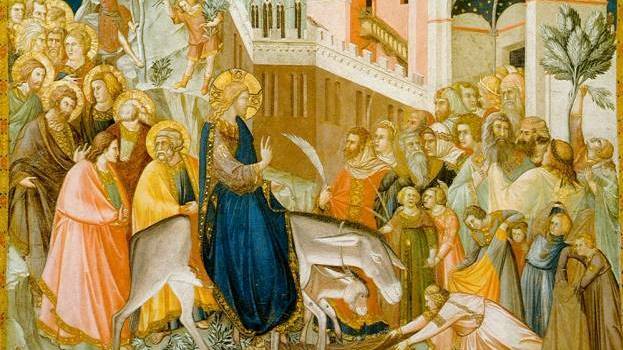 “Follow me!”, he tells them (Mt 4:19). That is what it means to be sent: to follow Christ, and not to charge ahead on our own! The Lord will invite some of you to follow him as priests, and in this way to become “fishers of men”. Others he will call to become religious or consecrated men and women. And yet others he will call to the married life, to be loving fathers and mothers. Whatever your vocation, I urge you: be brave, be generous and, above all, be joyful! Here in this beautiful cathedral dedicated to Our Lady’s Immaculate Conception, I encourage you to look to Mary. When she said “yes” to the message of the angel, she was young, like yourselves. Yet she had the courage to trust in the “good news” she had heard, and to express it in a life of faithful dedication to her vocation, total self-giving, and complete trust in God’s loving care. Like Mary, may all of you be gentle but courageous in bringing Jesus and his love to others. The sacred pilgrimage of Love and Peace comes to an end today.? It does not end. Our dear Holy Father has handed over the work love and peace to the young people. ?It has been very tough three days in Myanmar. But the sight of youth energizes our Holy Father in every part of the world.? He feels one with the youth of the world. His joy doubles in the company of youth. He trusts the youth. St. John Bosco trusted the youth. ?Holy Father today trust that the challenges faced by the country and the church can be faced with confidence by the youth. Today the colorful community of youth is a great hope not only for the church but for this country. Let all of you become a peace brigade, a peace army. This mass is the culmination of a great journey by our Holy Father. Church role is to generate hope. Our Holy Father is the apostle of hope. For the last three days Myanmar had the grace of being soaked in Christian Hope. His presence was the healing touch to this nation. As he ends his apostolic visit, on behalf of the whole church of Myanmar, I wish to thank the Lord for this miracle of Our Holy Father amidst us. 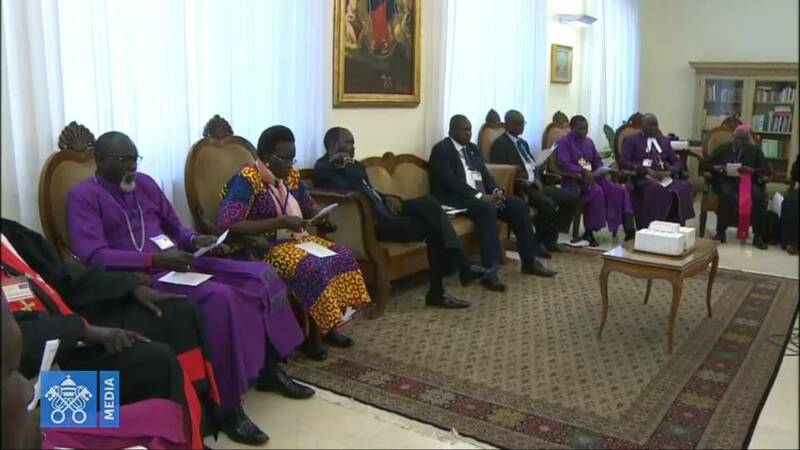 When you were elected Holy Father, you said the Fathers went to the remote corner to select the next Pope. As a Pope you have chosen to bless the remotest Catholic communities. We are deeply moved by your paternal love for this church. This is a blessed moment for us. We assure our prayers as you start another three days of hard work. May this nation's history be blessed from today because you have blessed this soil with your visit!